Bill Clinton will reportedly not attend the convention Thursday night. DENVER (CNN) - Hillary Clinton will be on hand for Barack Obama's acceptance speech, but according to a source close to former President Bill Clinton, he will not: the source tells CNN that Clinton will not join his wife at Invesco Field Thursday night. To Leslie. If Barack loses it will be because more people have seen just what he is. Don't blame it on anyone but him. What a poor loser. If you don't win, don't blame someone else. Grow up. Wow, what is new!?. 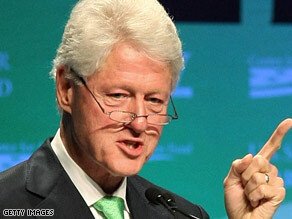 I expected for Mr. Clinton not to be present for this historic day. It is time that we as Dem, Rep, and Ind to UNITE and put our differences aside. This is NOT about the Clintons this is about OUR FUTURE. We must realize voting for Mr. Mc will be voting for the past and not for the future.